Thermal liner is the most popular member of the Wallrock Thermally Efficient Wallpaper range. Being 3mm in thickness it offers worthwhile energy savings, for example 15% on typical solid brick external walls. Wallrock Thermal Liner works to save energy from the moment heating is turned on by slowing down the rate at which a cold walls soak up heat energy - and allowing the room to warm up considerably faster, in many cases more than halving warm up times, creating a comfortable room environment with less energy. This effect is valuable in any home with solid walls and even those with external or cavity insulation - especially where the heating is regularly turned on and off. Once the room is warmed up and comfortable, Thermal Liner goes on working producing steady energy savings. Furthermore Thermal Liner has excellent capacity to cover and reinforce poor plaster and other surfaces such as plasterboard, block-work and wood paneling. Thermal Liner also helps reduce condensation problems and in many cases eliminates them - as more room warmth is retained at the wall surface at an earlier stage in the warm up phase there is far less opportunity for condensation to form on a cold wall and consequently a reduced risk of unhealthy mould growth. The surface of Thermal Liner is long lasting, durable and suitable for painting directly, although for a perfect finish we recommend cross lining with Wallrock Fibreliner (avoid the use of standard linings) which allows not only painting but the application of decorative wallpaper. 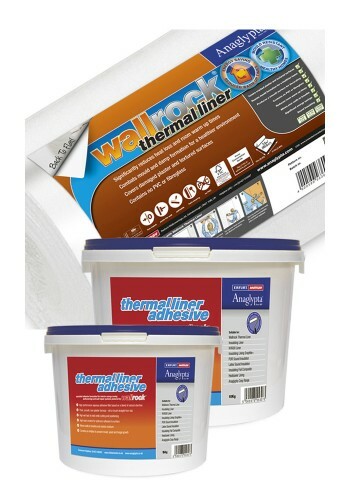 The only adhesive we recommend to hang the Wallrock thermally efficient wall coverings. Its amazing strength and unique formulation using filler compounds helps repair cracked and damaged walls and ensure straight forward reliable application every time. Also recommended for our range of polystyrene insulation products and sound insulation products.